UPDATE: due to twitter API changes, tweetgrid has stopped working – and there’s no word on how long it will be before it’s working again. There are certainly other options for running searches using the search techniques discussed below, but they don’t include easily shareable web-based multicolumn searches yet. After a discussion this morning on #smemchat, it seems as if we are all looking for solutions and work-arounds. Many of us are simply setting up multicolumn searches using tweetdeck and hootsuite. This doesn’t make things easily shareable, however, which is important for #SMEM and #VOST social media/disaster work. Mary Jo Flynn now has an agency account for Geofeedia, and is testing it. Chris Tarantino also has access to geoffedia and is testing. I’ve used their trial, but as Geofeedia pointed out, the trial version is limited and doesn’t deliver all data. I’m looking forward to hearing from Mary Jo and Chris how they like it. As Chris Tarantino pointed out, it’s pretty easy to open text and geosearches as well as text/geosearch combination searches in tweetdeck, and then move the most productive searches over to an advanced twitter search, which can be saved and shared one search at a time. Not ideal, but workable. Humanity Road also shared this great “hashboard” page that they’ve added to their website – it’s great to have access to this, and I’m sure it will be helpful, especially during the early moments of many types of disasters, prior to disaster-specific hashtags popping up within each disaster. Here’s a link to the entire discussion that we had regarding this on #smemchat this morning. Thanks to Mary Jo Flynn for her input, ideas and also for the chat archiving! I’ll definitely keep udpating here and posting as we find new/better solutions. Here’s a step-by-step how-to narrative for rapidly finding useful info on twitter, and how to easily save and share searches with others to assist in your search for timely, relevant, useful information. Let’s say you’ve heard rumor that there’s a disaster happening somewhere, but you have very limited information. How do you quickly refine your twitter searches and find useful information? How do you quickly identify relevant hashtags? During a disaster or event, these text searches will bring many results to quickly scroll through so that you can look for more relevant info with which to refine your search. When you find new and relevant information, create a new text search in new column to refine the search. For this example we’re trying to find specific location info that will help us to focus in on a specific area that may have been hard hit in a disaster. 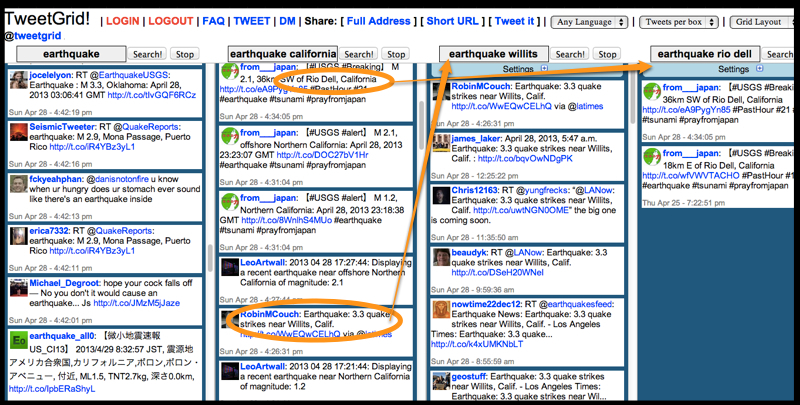 So the above [California earthquake] search at the time of a significant quake in CA would result in tweets with additional info for refining searches. Specific location names will appear; cities, town names would appear in the search result stream, and eventually a hashtag or two will appear in the results as well. 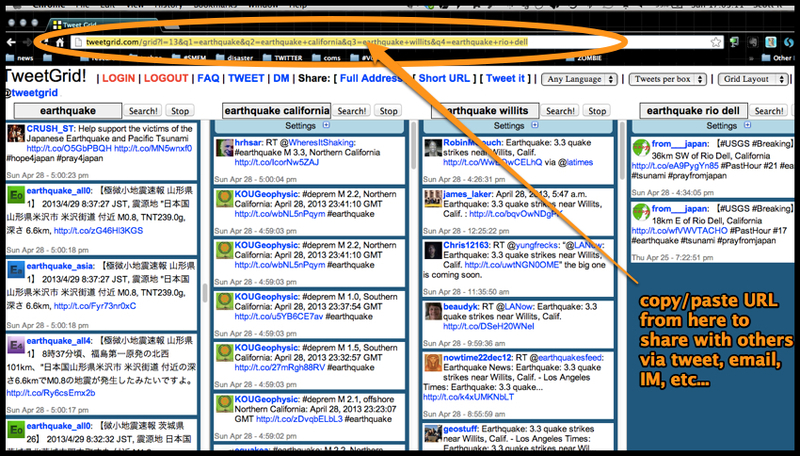 1d- Set up [earthquake location-name] and [earthquake #hashtag] searches in tweetgrid columns. 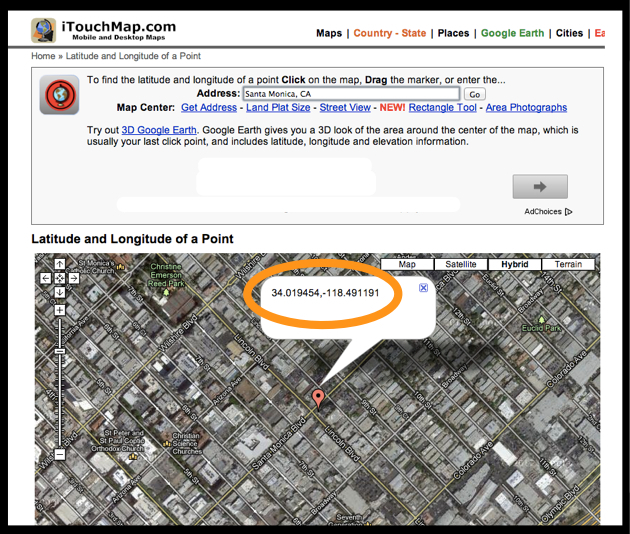 2- Open a web app such as iTouchMap.com and enter a specific address or city, state get the latitude/longitude. 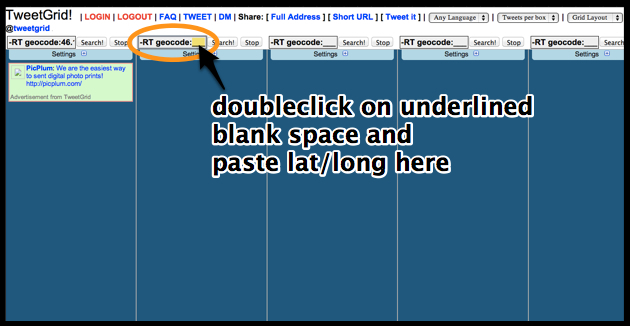 3- Copy the lat/long and insert into a geosearch template. 3b- Run the searches to see what the results look like. 4- Set up additional text and geosearches based on these results to further refine the searches. It’s helpful to share out info on the most used hashtags – watch for local officials to encourage use of specific hashtags – support their message when appropriate by sharing info on new hashtags to other tags that are in use. 6- If you’re working with a group – share the searches that you’ve created so that others can help you. 6a- In tweetgrid, after you have your search columns set up and running, move your cursor in your web browser window to the top white “Tweetgrid!” app menu area and click on “Share: [ Full Address ]”. 6b- The full address/link for this search can now be copied out of your web browser address window at the top of your browser. Highlight it, copy, and paste in to an instant message, chat window, tweet, email or however you wish to share it with others who can help with your searches. NOTE2: Save the geosearch template somewhere handy – bookmark an empty one or save in your notes – so that you can set up and operate quickly. I’d just like to credit and thank Gahlord Dewald (@Gahlord on twitter) for all of his excellent posts on twitter geocode searching, without which this post would not have been possible. Thanks Gahlord – and here are his posts – be sure and see these, especially if you are a hootsuite or tweetdeck user! Here’s a link to a googledoc called “#SMEM and #VOST Search” that has more search info including some web apps that allow you to search other social media platforms such as facebook, blogs, and more. You can use it here: http://www.i-resilience.fr/app/easygeotweets/ The source code is open and free to use. Your article was my inspiration. Maybe later, a V2 in order to show locations of tweets on the map but a lot of other tools to make asap. Looks great Cedric! I just tried it – I like the map and the ability to move around easily within the map to find a lat/long – I tried using the keyword/hashtag feature but for some reason that resulted in no twitter search. If I run the lat/long search alone it opens up a twitter advanced search just fine. yes I tried with a keyword only and not with an hashtag. This little bug that I didn’t see is fixed now. Thanks.